Wouldn’t it be wonderful to have the ability just to disappear so people didn’t notice you were there? I can think of a few boring receptions where I would have loved the opportunity! Perhaps that’s why I secretly admire the camouflage of wild creatures. Despite the bright colours, it is surprisingly easy to miss a grouse even if it’s close to the side of the road. This is one of the few that I saw. Of course, camouflage is also the bane of my wildlife photography. I wanted to find some photos of creatures completely blended in with their environment but then I figured out that I really don’t any. The frustrating reason is that I sailed right by them all and didn’t even know they were there! The vague outline of something in the photo above becomes this beautiful, plump ruffled grouse in close. Camouflage can be tricky even for near sighted people like me. For example, the grouse in the photo above is quite colourful as you can see from the much closer photo on the right. Yet the only reason it caught my eye was because it moved. Thankfully! By the time my brain connected the feathers, I was already past it and had to back up. I’m guessing this wasn’t the only one along the road. The most amazing disappearing act was this American Bittern. He was good and he knew it, standing there with his head cocked to the side, blending in perfectly. I was astounded to finally focus on the bird that had been standing there all the time keeping one eye planted on me. I was so close, I could barely fit the bird in the photo. When an obstruction came between us, I couldn’t find it again and thot he had left the neighbourhood. When I took a few steps forward, he shocked me by flying away. I also detected a little attitude. That’s all fine and well for multi-coloured creatures. You would think that camouflage would be a lot more tricky for creatures with solid pronounced colours like black or white. I was in for another surprise. Here I was heading down the road when I had this weird sense that I was not alone – I get that a lot. Imagine my surprise when I looked between the blades of grass and saw an eye looking back at me. It was attached to a skunk. With just a few blades of grass, the skunk had completely disappeared into the background. I have no idea how I spotted her. I don’t have much experience with skunks so I didn’t know whether I should give chase or head for the hills which is often a problem on the prairies. I decided to hold my ground take a few photos – what could possibly go wrong? I was hoping the raised tail meant she was happy. When the skunk moved I realized it also blended in perfectly with stubble. The surprises kept coming. I was also grateful that tail was pointed in the other direction. I figured that maybe the skunk’s stripe had some deceptive powers which made the black more camouflaged. Wrong again. I discovered that a black bear could stand behind a green shrub and completely disappear. Only after carefully searching the entire area did I spot those beady eyes. The photograph really doesn’t show the full extent of the camouflage. This photo reminds me of the surveillance bush on the Canadian show Corner Gas, which was filmed in Saskatchewan. There was only one small bush for miles around where the police would hide their car. The small bush didn’t cover much of the car. With all these camouflaged animals disappearing around me, I will have to rely more on my sixth sense to find them – despite its spotty record. This just seems to get harder all the time. That American Bittern’s camouflage is stunning. He is so self-confident!! So true. And the self confidence is quite humorous when you actually see him and it’s not working with you. Bitterns are amazing how they blend in when ‘hiding’ in the tall vertical reeds. If a breeze blows the reeds I have seen bitterns sway their bodies to perfectly match the movement of their environment. I would love to see it swaying with the wind – that’s awesome. They’ve got that hiding thing down cold. Great post–I chuckled my way through the prose and loved the photos. I think that I’m a lot like that bear when I’m trampling my way through the woods. Somehow I feel like the animals won’t see me if I stop moving and am completely clueless about the fact they probably detected my presence long before I became aware of them. It’s the sad fact that movement is often our first indication of our subjects and it is often too late to get a shot by that time. I’m glad the humour landed. I’m afraid I have some bear-like tendencies as well. I often go the other direction and hope that they’ll ignore me if it’s obvious I’m not trying to sneak up on them like a predator. Sometimes it even works. For either protection or advantage in hunting, evolution has helped the animal kingdom eat or be eaten. I see it a lot when photographing insects. Some absolutely disappear and are invisible until they move like your bittern. Once you spot them though, their reliance on camouflage keeping them hidden increases our ability to photograph them without movement. Predators such as crab spiders and ambush bugs adapt to the color of the flowers while waiting to grab an unsuspecting prey. Butterflies and moths have evolved coloring on their scales which sometimes looks like a big scary eye to ward off being eaten. That’s a great point about their confidence in the camouflage making it easier to photograph once you see them. The trick is finding them. I’m seen some shows on amazing sea creatures that use all types of tricks to hide out. It really is an amazing array of methods creatures use to survive. I so want to see, and photograph, a bittern, but no luck so far. Not surprising, looking at that amazing camouflage job! It’s really quite astounding. I think it caught a rare movement which is the only thing that gave me a chance. We have ptarmigans in Alaska, which are like the grouse. Their one and only defense is camouflage and I’ve nearly stepped on them many times on trails. The funny thing is they usually scurry ahead and lay down in the trail. No one can see me, they think. It would be fun to see those too. I’ve been in areas where they are supposed to be but, ya, never spotted them. Very interesting, enjoyable post, Lyle!! The close-ups are breath-taking! Happy to hear you enjoyed it. I am generally more fond of close-ups as well. Thanks so much. I liked that bear’s positioning behind the bush – made me chuckle. I have a long lens so it was quite a ways away. Excellent set of shots Lyle, really like the Bittern and the bear. Thanks. Those are my favourites too. Amazing creatures. I think that we’d be surprised if we knew how many animals were watching us in the bush without our awareness. Beautiful grouse.I saw n American Bittern in my pre-camera days. It was a fluke because it was so still and enjoyed watching it for a little while. I had a visit from a skunk while camping.Kept hearing rustling in the bushes by the fire, which came closer and closer… then I shone my light into the bushes. Saw a cute pointed nose then saw the two eyes then the stripes . OH. I said hello in my kindest gentlest voice and got up quietly and slowly walked away .It left. From the look of this one’s tail, you were lucky you didn’t get sprayed. I guess as long as you don’t appear threatening ? And the bear is almost laughable, as is the comment about “Corner Gas” because how could you hide beside something so small. But you can. Wonderful series of photos, Lyle. You be careful out there. It sounds like you’ve had a few interesting adventures with wildlife. I’m happy you were able to communicate with the skunk so well. That may be worth trying. I have a long lens so I wasn’t as close as it may seem still the tail gave me pause. Wonderful commentary and photos, Lyle and I’m glad you and the skunk remained in a state of detente! Thanks. I think it’s possible I may be more glad than you! Detent is a great word. The camouflage of that American Bittern is amazing. Being short-sighted myself (even with glasses), I find I can spot many birds only by the sound of the rustling leaves on the ground and then………..movement. Maybe I should turn it around and just be surprised every time I find something – especially like the American Bittern. Like you, I often use other senses as well depending on the circumstances. Perhaps what we both need is a highly trained spotter. Glad you enjoyed the photos. They were all fun to take. Have you ever noticed how spotting the first critter is always the harder? Then your brain somehow imprints the shape and the next ones are easier to see? I most certainly have noticed that. I wish there was a way to fast track that somehow so I could “see” better. I’ve never seen another Bittern so I’m thinking I need a little help. Beautiful photographs, Lyle. Well-chosen! I was going to mention Bittern when you brought up camouflage, but as I read down I saw you got a great photo of one. 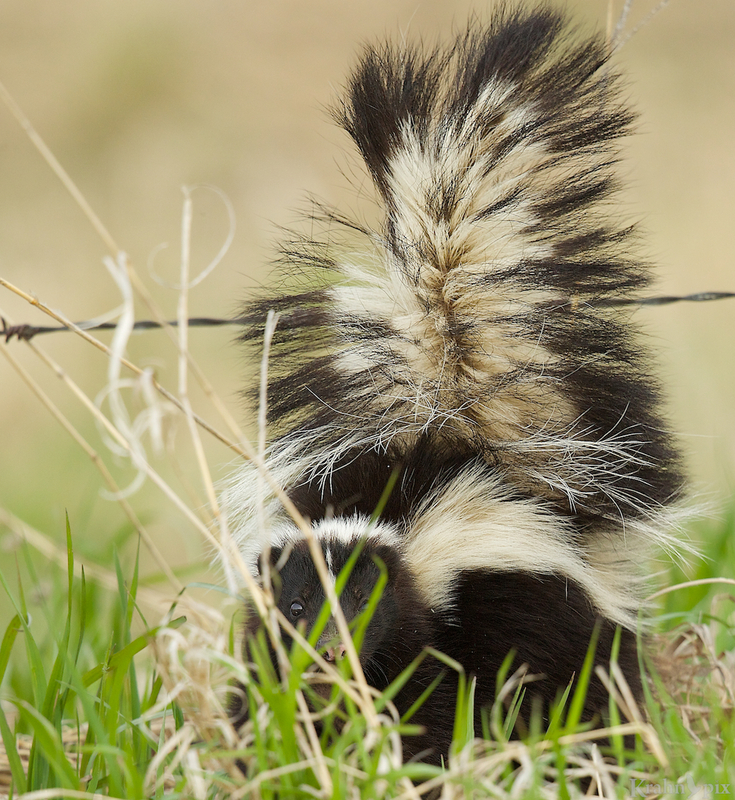 Skunks – I have a soft spot for those smelly litlte devils. We have a lot of them around here. What could go wrong? Ha! You’re lucky… 🙂 we had one at the Wildlife Center when I was young. Rosie was her name. Someone had descented her and kept her as a pet until they gave her up for adoption. Of course, she could never be returned to the wild. She would eat grapes by peeling them first. Those little forepaws are quite talented. Skunk tail up is not a good sign. If they start stamping their feet, run fast in the opposite direction. Glad you enjoyed the photos. I’m still amazed that I couldn’t find that Bittern again even though it was standing right there! I have seen some shows about skunks and they do seem like interesting creatures. Maybe they are just misunderstood! You had a great opportunity to see that skunk up close. I love the peeling grape story. I’ll remember the stamping feet thing! I love these photos! Really interesting post. You’ve got guts for hanging around the raised-tail skunk – I have no problem stalking skunks but if the tail comes up, I’m retreating. (Beautiful skunk, though! And stunning bittern.) This post makes me think about how much we use shape to find things; if you change the shape by hunching over or standing up very straight, or conceal part of it behind a bush, our brains don’t pick out the animal shape and we’re fooled. That’s so true about the shapes. I’ve watched some documentaries on how we see and so much of it is based on memory and thin slicing. I wish I could load a program into my brain to help spot all creatures better. I’m glad you the post. I do have a long lens so I wasn’t particularly close to the skunk but I don’t have any idea how far they can spray. Maybe I should check on that! Like you I need my glasses too – really need them. Animals hide from me all the time, well not so much hide, as stand still laughing. I walk right past them until they move or fly away. I think if I sat still this would happen a whole lot less. I was photographing some flowers and a hummingbird flew right up to my camera and hovered. I swear it was saying, “You missed me, you missed me.” And that I did! Really funny post Lyle. The skunk is a great shot, in grass and in the stubble. Lucky you the tailed stayed in the right direction. My lab got skunked many times and that is a smell that makes your eyes water. Like the bear hiding behind the shrub, but I have to say, that is not that great of cover for a big fat bear. As soon as we leave an area I can imagine the wildlife all getting together for a good laugh at our expense! At someone is enjoying it. I’m glad you enjoyed the humour. It’s entirely possible I may have overstated the risk of the skunk since I wasn’t close – then again I have no idea how far it sprays. Thanks so much. Yes I can certainly see how camouflage would give them lots of protection from predators. Unfortunately it also works on me!